Irresistible double Chocolate Fudge Ice-cream: Cambria Canterbury Countertop. Cambria Canterbury is like granite looking amazing engineered stone. My analogy is for not only Chocolate Fudge Ice-cream lovers; the granite lovers are also welcome to read. The swirling darks in the cream and caramelized sugar crystals shining on the surface belong to Cambria Canterbury Countertop.New Star of kitchen remodeling. Cambria Canterbury is such a big hiding agent for crumbs and dust like the homogenous looking granite countertops. The homogenous patterned granite examples are Baltic Brown, Tropical Brown, Brownie Granite, Brazilian Brown, Tan Brown, Giallo Venzeiano, and Giallo Fiorito. Cambria Canterbury Countertop is always very well coordinated with copper tone stained,sandstone finish black glazed maple cabinets, cherry cabinets from the lightest to darkest tone, chestnut stained birch cabinets,lyptus wood with truffle finish cabinets, maple cherry paprika cabinets. All natural color backsplashes with copper or brownish tones are always good with her and you can also use her as full high backsplash. Cambria Canterbury Countertop is such a gem to make novelty in your kitchen remodeling idea. She is very good with two tone countertop kitchen ideas as well as two tone cabinet kitchen ideas. If you go for the two tone countertop ideas, her best granite friends are : Ouro Brasil, Giallo Napoli, Bahia Brown and Imperial Coffee to make enough contrast. The other quartz stone could be mentioned as Cambria Clyde, which would be good addition to go in transition colors in countertops. Decision making was not easy to select the Cambria Canterbury Countertop pictures. Endless varieties. Hopefully you will like them all. Picture Credit: CR HOME DESIGN KB. Cambria Canterbury with two tone cabinets. Island Base is dark mahogany and perimeter is white ( i will update with the right stain name ). Red oak flooring and ample kitchen lighting give an incredible scenic for the Cambria Canterbury Countertop, Cambria Canterbury Island Top and Cambria Canterbury Full High Backsplash. 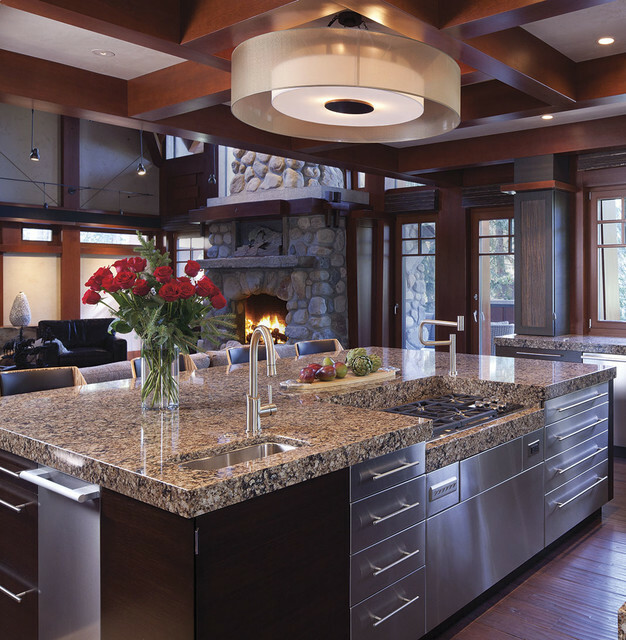 Traditional kitchen design meets with the modern touch. Very inspirational. Picture Credit: The Cabinet Store, Cambria Canterbury Engineered Stone is used as the countertop and the island top. Glass mixed color matchstick backsplash , gray bordered line ceramic tiles (details will be shared ) with stainless steel appliance and Multi Level wall cabinet design complete the puzzle. Cabinet wood is lyptus and finish is truffle. This kitchen seems to me very joyful and it consists of very live elements . Good hands care the good stuff. Picture Credit: South Shore Kitchen Design, Two tone cabinets in the traditional kitchen. I think all the details bond organically in this kitchen to express the beauty of Cambria Canterbury Countertop and Cambria Canterbury Island Top. Perimeter cabinets are made of maple wood with sandstone finish and black glaze , island base is cherry with grape finish. Copper kitchen pendants and custom finish dark oak floor , meticulously selected leather bar stools and stainless steel appliance are all dreamy. The backsplash selection is also very good idea, behind the stove is easy to clean glass mosaic and the sides are glass subway tiles ( all the information will come soon, still working on it ). The design taste is very rich and bold. Picture Credit: Oakville Kitchen and Bath Center, Honed travertine subway backsplash and Cambria Canterbury Countertop are just right for the Cherry oatmeal finish cabinets . The tones are very warm and welcoming in this kitchen. Picture Credit: Acadian House Kitchen and Bath Design. This picture is and excellent example for the Cambria Canterbury and Cambria Clyde are used as two tone counter top in traditonal kitchen design. The overhang island top of Cambria Canterbury and Countertop Cambria Clyde are transitional colors. The entire picture could not be expressed without backsplash (Emperador light marble, 1 x 2 Arched Brick mosaic, textured tile) , light color porcelain flooring (Granita, Faimdre, Goma) and dark soft stained cabinets…. I am in love…. I hope this article finds you very well for your kitchen remodeling ideas by using Cambria Canterbury Countertop, please do not hesitate to add your valuable comments.